Alan is a lean manufacturing expert with skills gained over an eight year period at Toyota followed by eight years in Uniparts expert practice. Whilst Alan has an abundance of experience in applying lean tools having a TPS background, his real ability is in engaging an organisation’s workforce in a truly collaborative manner, bringing genuine enthusiasm and a great sense of humour to the process. Gary joined Cummins Inc on their graduate supply chain programme, gaining his Six Sigma black belt early in his career. However, the real test to any learning is in the “field”. Following the Tsunami in 2011 he was tasked in managing the Japanese supply base, with over 30% of the components at risk. Working cross functionally identifying exposure, risks and mitigation the Japanese supply base was stabilised within two months with minimal cost to the business. Gary also supplies an abundance of Irish charm to everything he does. By Clive Black, Head of Research, Shore Capital. The British supermarket scene is in a febrile state. A number of factors have come together to take the sector to the brink of an all-out price war, perhaps it is one already, for the first time since the mid-1990s? We cannot predict the outcome of current developments suffice to say that conditions have already lead to a material contraction in the profitability of Morrison’s and Tesco UK and we harbour growing concerns over the robustness of our estimates for Sainsbury’s. So how did the industry arrive in this position and where may it lead? Clive is one of the UK’s top five stockbroking analysts in food and drug retailing. He was rated first for coverage of smaller companies in this sector in the last Reuters’ survey. Clive holds a PhD. from the Queen’s University of Belfast, his thesis being on the Northern Ireland food industry. He worked in London for the National Farmers’ Union for five years and then joined Northern Foods plc. He moved into stockbroking research with Charterhouse Tilney where he was for eight years when it latterly became ING Financial Markets. 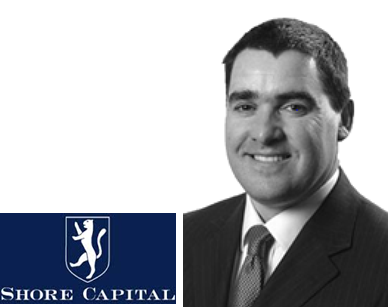 He joined Shore Capital in 2003 as head of research. As ever there is not one simple answer to the question of how the industry has entered conditions of war. The new conditions reflect an amalgam of processes that most fundamentally involve the Big Four British supermarket groups losing sight of their customers’ needs and wants; despite all of the purported listening devices, micro-data and focus groups. Accordingly, the industry became focused on protecting gross margin rather than thinking about where sustainable sales growth could be derived from. The retailers did so in reaction to a sustained period of input cost deflation coming to an end in 2006, replaced by inflation, which may be coming to an end in 2014. Through this change suppliers drove through price recovery, and a bit more, seeking to support volumes through promotions. Initially this strategy worked. However, rising promotional participation corresponded with one of the deepest consumer recessions ever witnessed in the UK. The over focus on inflation, promotions and gross margins effectively took the big supermarkets away from their customers. Those supermarkets were not, however, working in a vacuum. Competition seized the moment provided by an industry now drunk on promotions, dishing out vouchers like confetti and seeking to reassure shoppers by price matching. Price matching to some seemed insidious whilst households struggled with rising costs and flat incomes. With price rises abound, supermarkets’ focus on their own gross margins was about to become an issue as the LADs (limited assortment discounters) with lower prices and few promotions started to take hold. The situation that followed was a particularly painful position for the Big Four to find themselves; in an industry suffering falling volumes due to households de-stocking and cutting waste, combined with growing competition from the LADs and eating out. Whilst so the gross margin myopia continued and the disconnection between customer and supermarket widened. In autumn 2013 all this came to a head when each of the Big Four lost market share at the same time; we’ve never seen that before. Change was coming; it was a case of when not if. Asda stopped the vouchers and quietly started to narrow its price file with Aldi, leading to a stabilisation and then improvement in Wal-Mart UK’s share. Industry rhetoric then intensified, first Tesco’s laughable £200m price cutting pledge, then the big one; Morrison’s reset, which took industry shares down to levels at or in Morrison’s case below it net asset value, which brings us to the present day. The industry and its shareholders now face an unpleasant time to see if contagion takes hold. Will Aldi seek to widen a price differential, which now has less of a lead? Will Asda, which is now outperforming, invest more to underscore better momentum? Is Morrison’s price cutting real and is there more to come? And what of the elephant in the room; will the market leader Tesco eventually behave like one and take the initiative? Quite how this all pans out remains to be seen but the middle of 2014 maybe nervy, good for consumers and with supermarkets now firmly engaged with their clients, maybe better for the retailers down the line.